Economics is a living science--and you can make a contribution. 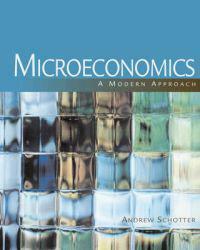 Dr. Schotter's new MICROECONOMICS: A MODERN APPROACH shows you how to go beyond studying theory and effectively apply what you learn to your future studies, career, and life. Professor Schotter believes the future of teaching microeconomics will be heavily connected with the use of experimental tools. As a result, MICROECONOMICS is built on an experimental economics framework that emphasizes game theory, strategic analysis, and organization of the firm, without skimping on traditional topics like consumer choice, production and markets. Each chapter and section builds upon a unifying theme of how economic institutions develop to solve problems that arise in a society. Concepts are presented within the context of a society that starts out in a primitive state of nature and gradually develops the characteristics and institutions of a modern economy. Illustrating various points of view, the text also helps you sharpen your critical thinking skills as it presents theories as well as their deficiencies. Applying intermediate economics to everyday life, MICROECONOMICS: A MODERN APPROACH is a text that will further your core foundation for studying economics.